In the morning we woke up by a sudden noise. 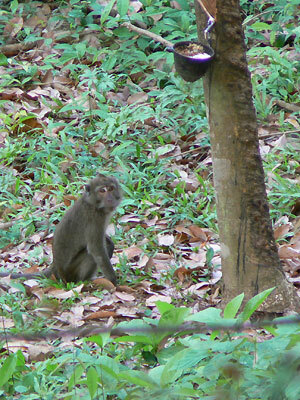 When we looked out of the window we saw some monkeys dashing through the rubber plantation next to the resort. 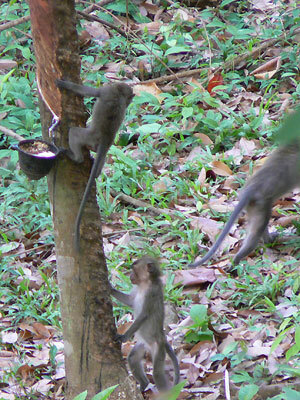 I'm still not sure if they really eat the raw rubber but it was fun watching them anyway. Since we were up already we went for a morning beach walk which was really wonderful. After breakfast we met with Christine and Sam from San Francisco (now moved to Hawaii) who would join us on the snorkelling trip. 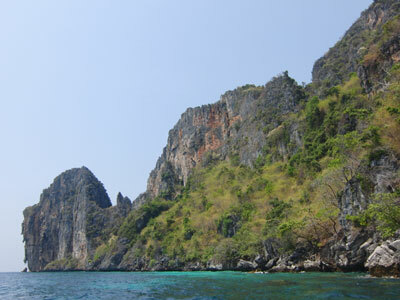 The plan was to head for Koh Phi Phi Leh first and then continue to Bamboo Island. 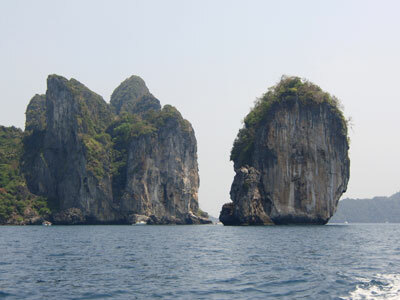 Both islands are part of the Mu Ko Phi Phi Marine National Park. You can find a map of the tour here. About halfway we met a small ferryboat with a broken engine. The boat was the regular ferry from Koh Jum to Koh Phi Phi Don and so all 7 passengers changed to our long-tail and we made the detour to Koh Phi Phi Don. 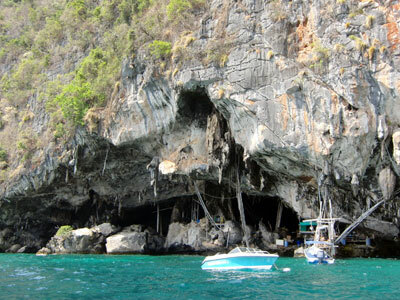 We did not intend to visit Phi Phi Don initially, and after the ferry passengers had disembarked we knew that we definitely would not have missed anything. It's a shame how this beautiful island is built up with hotels - at least here at Ton Sai Bay - so that its former natural beauty can at best be imagined. After the 2004 tsunami a heedless construction boom had started and by now some hundreds of thousands of tourists invade the island every year. The small island can in no way cope with the amounts of garbage and wastewater produced by this tourist industry. 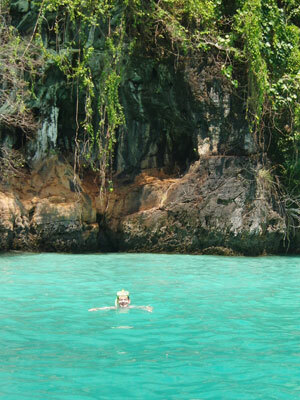 We then continued to Koh Phi Phi Leh, which became world-famous thanks(?) to the movie "The Beach" from 2000 starring Leonardo DiCaprio. According to that fact there is a lot of traffic around the island and since we were late due to our "ferry service mission" many boats were already anchored in the fjord-like Pileh Bay. On the way we passed Viking Cave where terns breed and their nest are being harvested to be sold to chinese customers. Bird's nest soup is a delicacy in China and the price for the nests can reach up to 75 % of the current gold price! We were all displeased about the bay being crowded that much and the noise from the boats' motors and so we decided to leave after a short time. 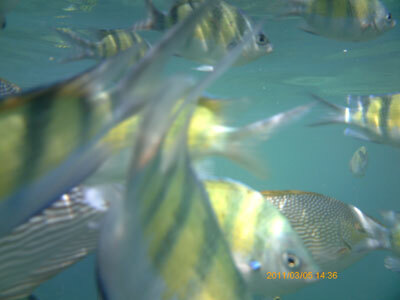 We could not see any fish in the quite cloudy water, anyway. 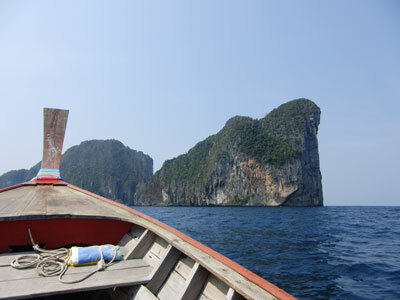 We continued to Maya Bay going round the island's south side. 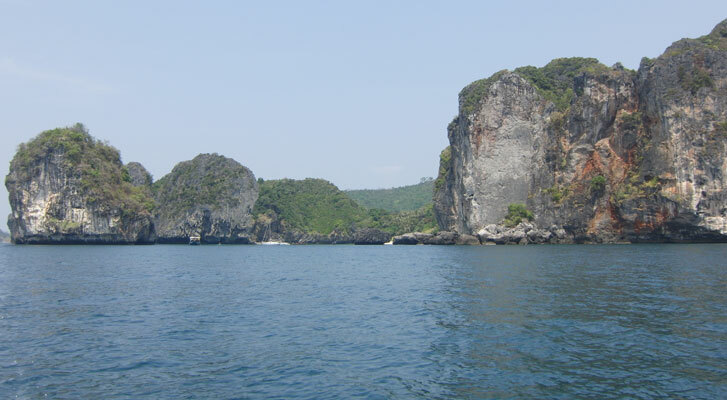 The sheer limestone cliffs rising from the water are very impressive and at least here the unspoilt natural beauty of the island can be enjoyed. 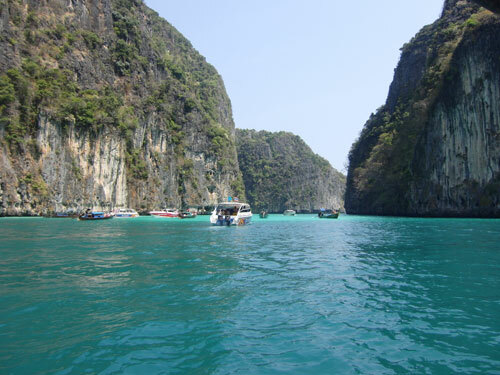 There were even more boats in Maya Bay than in Pileh Bay before with many long-tails and also cruise vessels holding up to several hundred of passengers. 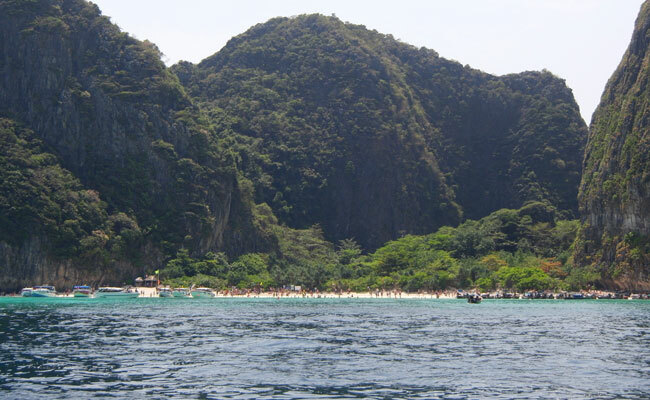 "The Beach" was clogged with boats and crowded with people coming for day trips from Phuket, Krabi and of course Phi Phi Don. This time we were really shocked and all of us wanted to get away immediately. Of course we know that these days it is impossible to have such beauty for yourself but the huge numbers of screaming and cheering tourists and the big excursion boats blasting their speakers seemed absolutely out of place to us, especially considering the whole area being a national park after all! Fortunately we did not leave but jumped into the water instead. The underwater world made up for the hustle and bustle up there and in the peaceful tranquility we were soon surrounded by a multitude of fish - also thanks to the breadcrumbs we had brought along. 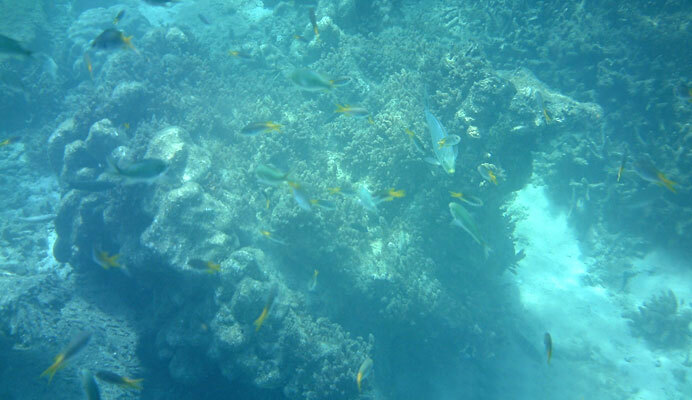 The underwater camera passed its first practical test and thankfully held tight until the end. 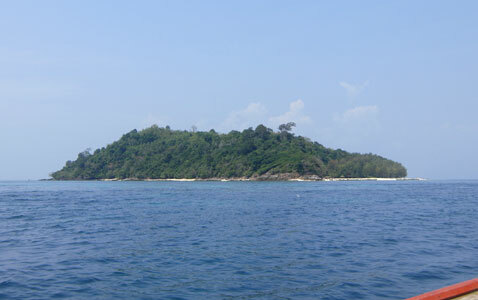 After lunch - we had brought fried rice again - we continued to Bamboo Island. 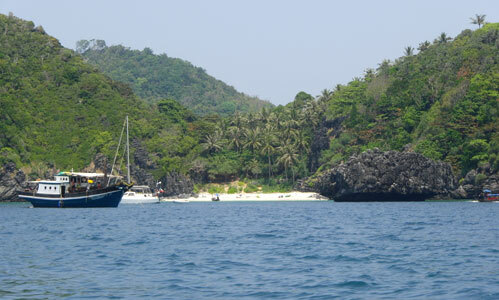 On our way along the much less developed west coast of Phi Phi Don we could even see some unspoilt pristine beaches. 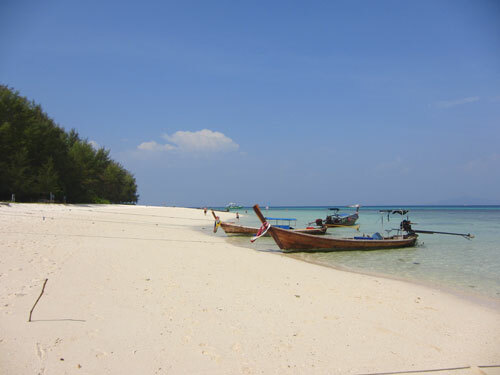 There were some boats anchored at the snorkelling spot near Bamboo Island but this was nothing compared to the teeming crowds over at Maya Bay. 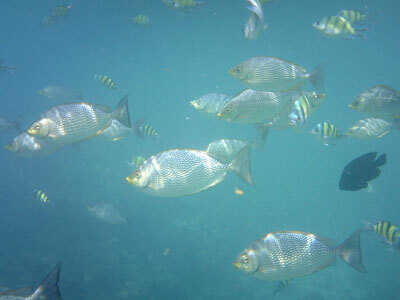 As soon as our boat's motor was off we were surrounded by fish and we hurried to get fins and snorkel to jump into the water again. 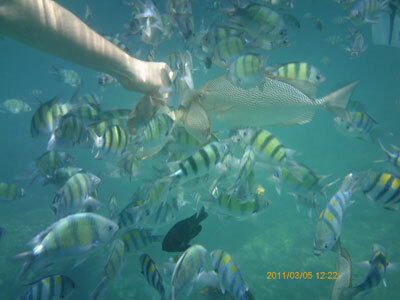 There were even more fish here and we snorkelled for almost 45 minutes. 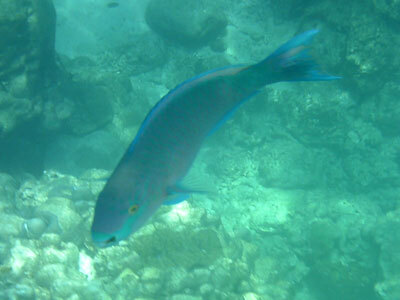 As can easily be seen at the picture with the parrotfish the reefs are all dead by now due to progressing coral bleaching. 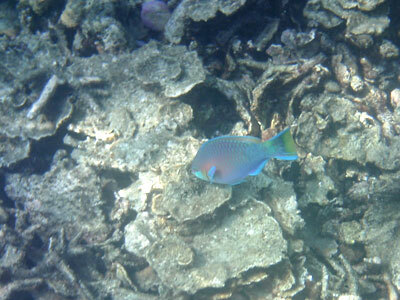 Even though we were very impressed by the colourful fish, we also could not help the feeling to dive in a cemetery. The reasons for the dying reefs are on the one hand water pollution (you can find washed up plastic bags on the loneliest beaches, and I really don't want to imagine what happens with all the waste water and garbage from Phi Phi Don and other small, highly frequented islands) and also the high sea temperature, exceeding long-time annual means throughout the last couple of years. 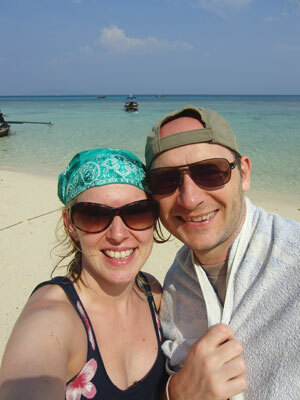 After snorkelling we landed at Bamboo Island with its snow white sandy beach. By now we also felt fairly sunburnt, despite using SPF 30 sunscreen. Especially neck, shoulders and the back of the legs were affected since these parts had been facing the sun all the time while snorkelling. 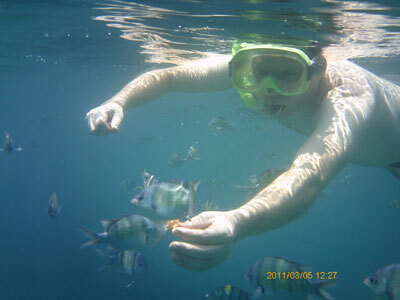 We had mixed feelings about the snorkelling trip. 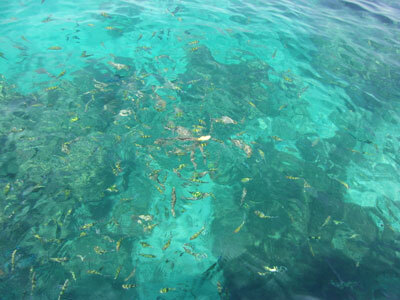 There was the fascination of the underwater world, but also great dismay about the progress of its destruction. 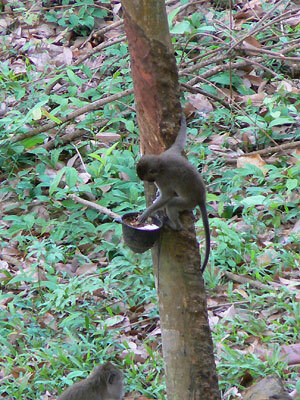 And, alas, also the sad realisation that we also played our part simply by doing the trip and staying in the area. On the other hand we also hope that the income created by tourism might help fund desperately needed environmental protection measures.